Star Wars Rebels introduces not one but two Inquisitors that will hunt the Ghost crew for -I presume- the entire season while Ezra, Sabine, Zeb and Chopper are on a mission to retrieve medical supplies. This episode felt a little bit disjointed tonally. It tries to juggle horror, drama, action and comedy throughout the short running time and doesn’t really manage to pull it off. That’s not to say it was a terrible episode because it certainly wasn’t but the tonal shifts were very jarring. I really liked the start of the episode where Kanan and Rex were at odds over the best way to train Ezra. Rex seems to think that a soldier’s discipline is a good basis for an effective Jedi where Kanan is pretending that he knows better but really doesn’t. Kanan’s weaknesses as a teacher have been a recurring theme since he started training Ezra so it’s realistic that he would get defensive when someone else recognises that in him. His attempt to lift Chopper is a great example of this as he’s told to not trust his eyes and rely on his Jedi senses but that proves to be ineffective when Chopper has fixed himself to the floor. Rex proves that Jedi should use every tool at their disposal to be the best version of themselves and it’s hard to disagree with them. He also talks about Anakin again but doesn’t mention him by name. I don’t understand what the harm would be in using his name as his identity as Darth Vader isn’t common knowledge so it really wouldn’t raise any flags with any of the characters outside of Ahsoka who doesn’t know for sure at this point. Lots of time at the start of the episode is devoted to the clashing ideologies of Rex and Kanan that it seems like it will be a significant part of the episode but for whatever reason it is completely abandoned once Ezra, Sabine, Zeb and Chopper leave. Their mission plays out like a horror with long, dark hallways and unidentifiable sounds with a tense musical score to complete the mood. It’s a well put together set-up that really promotes a sense of foreboding and constantly suggests that something bad is going to happen. It’s a shame that the set-up is ruined by the awkward comedy associated with getting Zeb stuck in a vent. It makes no sense for Zeb to even try to squeeze himself in there and as jokes go, getting stuck in a vent is pretty low on the comedy scale. The introduction of the new Inquisitors is pretty well handled but a little uneven when taken as a whole. According to the credits they are known as Seventh Sister (Sarah Michelle Gellar) and Fifth Brother (Philip Anthony-Rodriguez). They both feel very different as characters with Fifth Brother being a hulking, almost brutish figure that really helped add to the horror atmosphere. I liked the parts of the episode where he was stalking Sabine, Zeb and Chopper. His casual outwitting of their trap shows how skilled he is and how much of a threat to them he can be. Seventh Sister is much more of an enigma. She doesn’t see Ezra as a threat so takes him hostage and decides to toy with him. She points out the failings of Kanan as a teacher and makes her knowledge of the existence of Ahsoka well known. It’s implied that she has some sort of history with Ahsoka which might be interesting if it comes to anything. Ezra’s impetuous nature is a good foil for her as he doesn’t seem afraid of the situation he is in. I like that her attempts to turn him to the dark side go absolutely nowhere showing how much stronger he is with the force and how confident he is in his abilities. The escape scene is very clumsily handled. Zeb’s obviously coded message about keeping their chin up to indicate that he was hiding on the ceiling really shouldn’t have worked for a variety of reasons. For one thing the Inquisitors should have had the spacial awareness to notice the Phantom or even sensed it with their force powers. Either way it shouldn’t have been that easy to sneak up on them and subsequently escape. Star Wars Rebels is capable of framing a better action sequence than that. I was very confused at the attempt made to make it look like Zeb might be considering leaving the others behind. It was a misdirect that didn’t work as his character would never do that. The crew have grown closer since the first season and it’s not in Zeb’s nature to abandon his friends. There’s a sense that the characters are terrified of this new threat but based on what has been seen here the Inquisitors feel like a significant threat in some ways but not in others. 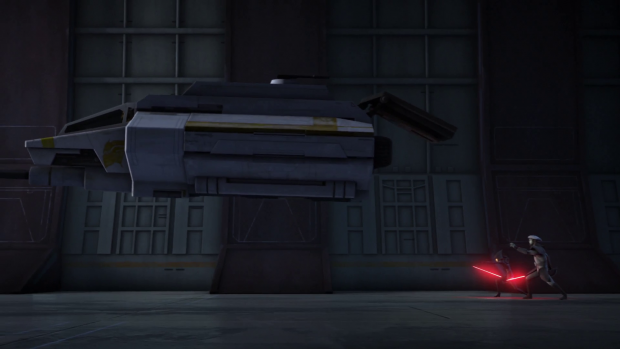 I liked the clash of ideologies between Kanan and Rex who differ on their opinions of how Ezra should be trained. 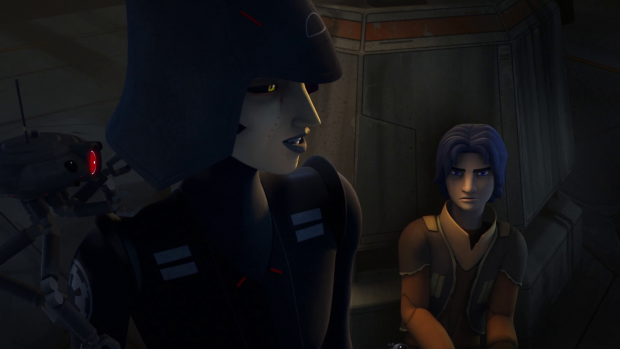 Rex thinks that there should be military discipline at the root of it and Kanan gets defensive when his lack of teaching ability is called out. This clash would have been a good basis for the episode so it’s a shame that the episode shifted gears. Ezra, Zeb, Sabine and Chopper’s mission plays out like a horror with all of the familiar tropes such as long, dark hallways, unsettling sounds and a creepy score. The attempt at comedy of Zeb getting stuck in an air vent really didn’t work and went against the atmosphere that was being built. The introduction of the Inquisitors is handled reasonably well with Fifth Brother being a hulking, almost brutish figure who casually stalks Sabine, Zeb and Chopper while outwitting their traps. Seventh Sister is much more of an enigma and clearly confident in her abilities as she toys with Ezra. She doesn’t see him as a threat and attempts to turn him to the dark side with no luck. It shows how far Ezra has come and how confident he is. Zeb’s escape plan is very clumsily handled. There’s no way that the Inquisitors shouldn’t have decoded his obvious message and they definitely should have seen or sensed him hiding on the ceiling. The characters are acting like the Inquisitors are a significant threat but it’s not completely coming across at this stage.